Since I’m writing an article about access at the remaining Harvey Houses of the west, a stop at La Posada in Winslow, Arizona was a must-do on my itinerary. As expected I was simply wowed by the architecture, historic photos and large collection of southwestern art at this grand old gem; however I also came away with an added bonus – an excellent breakfast at the hotel’s Turquoise Room. I had heard pros and cons about the restaurant, with slow service being a recurring complaint; so I was a little dismayed to see a line at the podium, with no hostess in sight, just five minutes after the restaurant supposedly opened. Shortly thereafter an employee poked his head out of the kitchen, saw the growing line and quickly came out to seat patrons. From there on the service was quick, efficient and first-rate – just like you’d expect at a Harvey House. And I have to say that breakfast was a real treat. I stuck to the more traditional side and had some poached eggs with ham, but they also added some spicy southwestern breakfast potatoes in place of the standard hash browns you get at most breakfast joints. And since I don’t do bread, the waitress even offered up a fresh fruit cup, which I devoured. 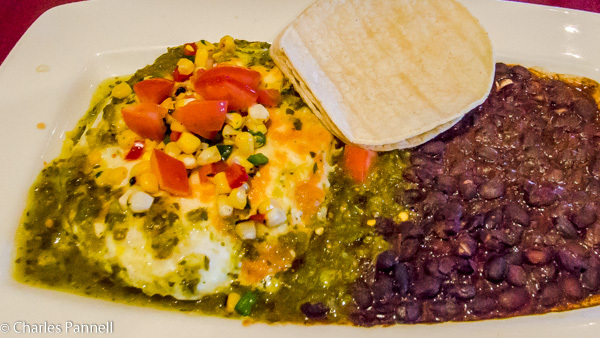 Charles however went for the Arizona Green Chile Eggs, which was a regional version of Huevos Rancheros. It started with a bed of corn polenta with green chile and tomatillo salsa, which was topped with soft-cooked eggs, jack cheese, corn salsa and diced tomatoes. A hearty helping of black beans was served on the side, and the dish was accompanied with some fresh corn tortillas. It looked delicious and got a big thumbs-up from Charles. The prices were reasonable for a restaurant of this caliber too, and our check came to $23 and change. To be honest I’ve paid more (and gotten less) at many hotel breakfast buffets. And you just can’t beat the atmosphere either, as you are surrounded by historic southwestern folk art, and photos of the property in its previous incarnation. Plus, in true Harvey House fashion you’ll see a train or two pass by while you dine. As far as access goes – they did an excellent job in the restoration. There’s accessible parking near the main entrance, with level access through the gift shop to the Turquoise Room. Although it’s a bit of a trek for slow walkers, wheelchair-users shouldn’t have any problems. And if you get tired, there are benches and tables to take a break, just to the left of the entrance. Even if you can’t spend the night at Las Posada, take some time to hop off Interstate 40 and have a bite to eat at the Turquoise Room. You won’t be disappointed, and maybe like me, you might even be nicely surprised. This entry was posted in Food, Lodging, Road Trips and tagged Arizona, breakfast, food, Harvey House, historic, hotel, La Posada, winslow by Candy B. Harrington. Bookmark the permalink.